We’ve got both bestselling and newly-minted authors, agents and editors, and other industry professionals holding live Q&As and pitch sessions and sharing their knowledge in blog posts and vlogs and podcasts. We’ve got critiques by industry professionals for sale — a rare opportunity to have agents, editors and awesome authors give you feedback on your work. We’ve got super fantastic forums where you can connect with other writers and get more critique — and maybe even catch the eye of one of our super-stealthy ninja agents! But — cue dramatic announcer voice — that’s not all! Panels. We’ve got at least four panels confirmed so far, discussing topics ranging from diversity in kidlit to writing picture books. These are going to be incredible conversations you won’t want to miss, including some familiar and leading names in the industry. Sensei authors. Anyone who’s attended before will probably be familiar with our ninja agent program. This year we’re adding some knowledgeable mentors by inviting traditionally published authors to use their own writing experience to offer helpful feedback, too. Our goal is to have every writer who posts material receive some feedback from an industry professional! Red Pencil Sessions and Story Consultations. These will be available alongside the more traditional page and query critiques in our Indiegogo campaign this year. When you buy a Red Pencil Session you’ll get the opportunity to discuss — like actual two-way conversation, by Skype or other methods! — your pages with the industry professional who read them. Story Consultations offer you the chance to hash out writer’s block, plot holes and character problems with industry professionals who can offer unique insight and advice. And perhaps my favorite addition of all this year — there will be swag! Because no conference-going experience is complete without a souvenir of your time there. We’ll be selling t-shirts, mugs, notebooks, and more featuring designs created just for WriteOnCon 2018. (They’re gonna be awesome. I’ll be buying five.) Watch for our announcement here and on our social media channels when the shop goes live in November. I am Pretty. Darn. Stoked. 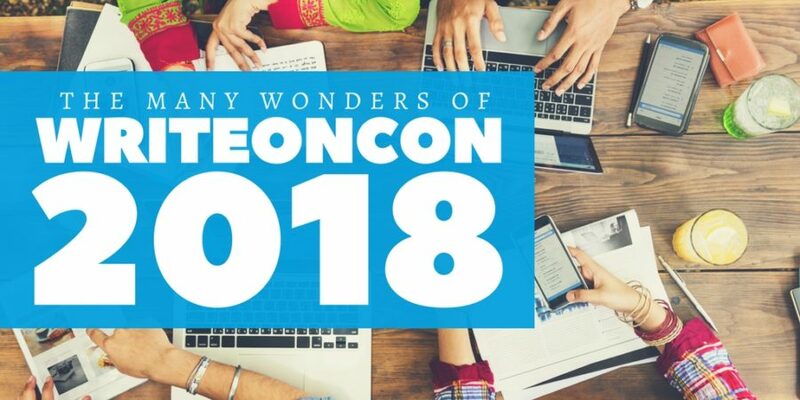 We’re bringing back some of last year’s fantastic speakers, but we’ll be showcasing even more new faces for WriteOnCon 2018. We’re making an effort to include more professionals from areas beyond MG and YA this year — we’ve already got some incredible PB events lined up, for instance! And we hope to surpass last year’s total of 105 speakers. Judging by how many people have already signed up (nearly 40, as of this writing! and we’ve only just begun!) we’re well on our way! We’ll be adding names to our speakers page as they’re confirmed, so check in there to see who the latest participants are! And while you’re there, swing by our WriteOnCon organizers page to meet our hardworking team. The core team members from last year — myself, Alyssa, Carey, Hannah, Amy, and Jen — are all back this year, but we’re joined by a whole bunch of new, enthusiastic recruits to help make our workload a little easier — and hopefully keep things running more smoothly. We can’t wait to show you what all we’ve got brewing. Follow us on Twitter (@WriteOnCon), Facebook, Instagram, or here on the blog to catch our updates and be the first to hear news and announcements — like speaker additions, new Indiegogo perks, or giveaway promotions. Share your excitement for the conference using #WriteOnCon2018 — we love to hear from you! Nice Alyssa!! I love what you are doing! I am really looking forward to another year of WriteOnCon! I have been editing my current WIP with hopes that I can get some helpful critiques. I am planning on submitting my first 250-500 on the forums if available, but my work contains a prologue. My prologue gives information and intrigue to the story but doesn’t contain the protagonist, whereas the first chapter dives right into the protagonist’s life. Should I submit this for the first 250 or go straight to the first chapter? I guess the real question is does anybody read prologues anymore? Keep up the great work. I’m counting the days! Prologues are definitely a tricky beast. I think the general rule is, if you can possibly in any way move the information in a prologue to the main story-line, it’s better to forgo the prologue itself. There are definitely still some books that pull them off, but they’re few and far between. Generally it’s safer to open with your main character and let the information filter in!